HIPPIELUVN'S HALLOWEEN HORRORTHON 2018 - Page 5 - Halloween Discussion Forums, Costumes, Horror! Halloween Discussion Forums, Costumes, Horror! TMC is doing a great job of entertaining us this last weekend before Halloween. They just finished showing The Ghost and mrs. Muir and now it's The Ghost and Mr. Chicken. Both fantastic in their own unique ways. Prepare for death & follow me. My wife has finally given in to seven years of trying to turn her into a horror fan. She LOVES Myers. Last night we watched Halloween Curse of Michael Myers. I had not seen it since '96, but we both agree, movie is bad. * 1/2, mostly for Donald P.
Tonight, it's H20's turn. I have not seen it since the theaters in '98. How was the Halloween 2018 movie? I am planning to watch it on this holiday. Thanks for sharing your annual horrorthon! Many of these movies I also own and love. Ghost and Mrs Muir is an old fave, and we have the History Channel docs, too. What a marvelous day you have planned, Sleepy Hollow and Phantom! 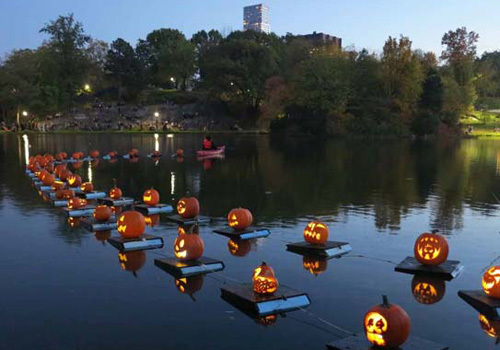 Thanks for the photo of the Central Park pumpkin flotilla. You'd think they'd show that on TV, but I had never seen it. October goes by too fast.